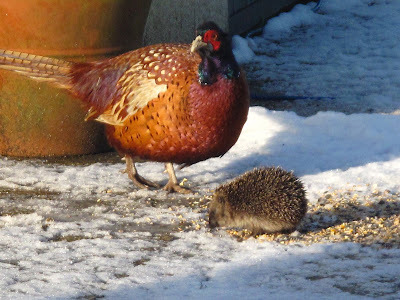 We were amazed to see a hedgehog appear today while watching the birds feeding in the snow. He was only little, so we gave him plenty of food to help get through winter. 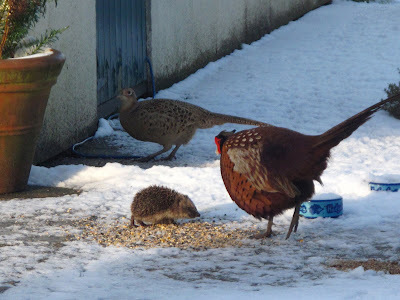 The pheasants weren't too sure what to make of him! Update:The first picture was shown on BBC Look East on Monday evening - except they stuck a BBC banner right across the hedgehog which kind of defeated the point of sending it to them! Pictures and report on Hadrian's Wall path is finished. 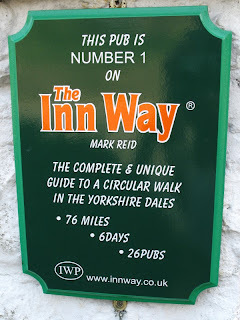 The next report is already underway, the Cumbria Way, which we walked straight after Hadrian's Wall (the two link together nicely). I've added up the miles from walks this year on long distance paths and it comes to just under 400 miles taking their 'published' distances. In most cases I think we do at least 10 miles above that, with detours to bed and breakfast, visiting places on the way etc. 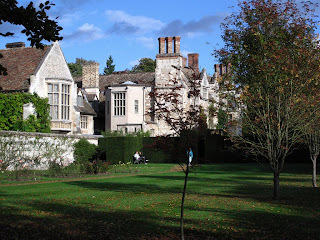 With the perfect autumn weather we took a trip at the weekend to visit another nearby National Trust site - Anglesey Abbey near to Cambridge. Although the house looked lovely, we decided to miss this out today. With our NT membership we find that we tend to be more relaxed about visiting places and don't feel we have to rush and try to fit everything in. 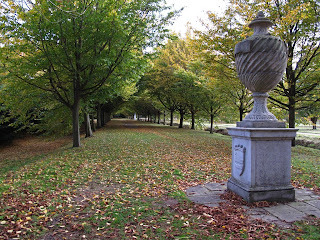 The gardens are extensive, and very well planned. Each area flows into the next quite naturally so we didn't have to keep doubling back on ourselves. 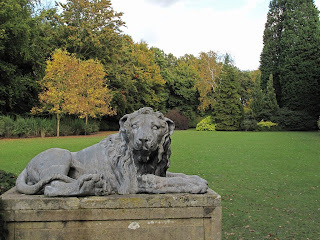 There's a mix of formal gardens, avenues and woodland. 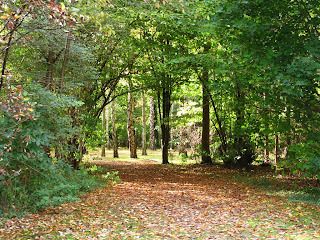 The trees are varied, and so are in different stages of colour changing. Despite all the compaints about a wet summer, apparently it has been a perfect season to produce this autumn display. 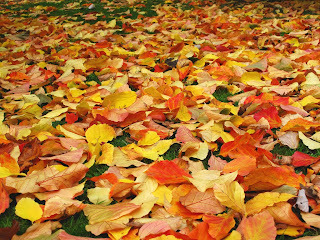 Lots of leaves on the ground too which were great to rustle through. 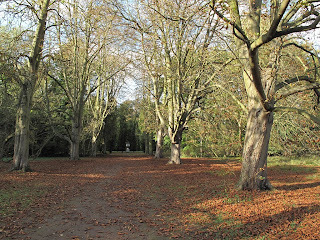 Each avenue we walked along had people taking photographs. Though everyone was quite polite and took turns, which means it doesn't look busy at all! I always wonder how much of these planned gardens the original owners ever get to see. 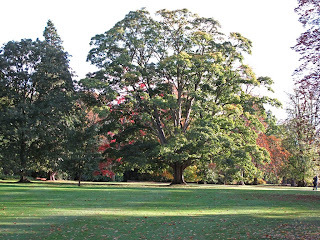 It must take years before everything is complete and the trees are fully mature to give the final effect. A final shot which is now on the background of my computer. 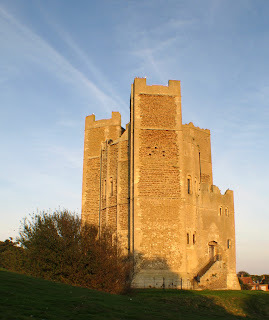 For a change this is a post about somewhere in Suffolk on my Suffolk Blog. 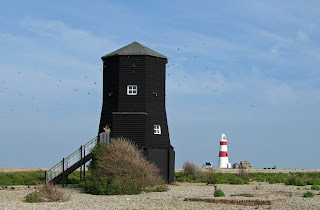 Last weekend we took advantage of the great weather that's finally arrived and went for a day out to Orford. Here we were able to use our memberships in both the National Trust and English Heritage all in one day. 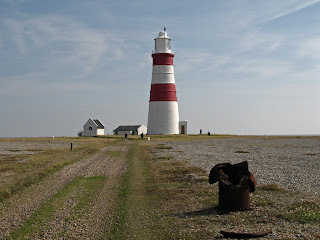 First was a trip over to Orford Ness on the National Trust ferry. The trip costs just £3.70 for members, and you can spend as long as you like on the Ness, subject to catching the last ferry back at 5:00pm. There are trails to follow around, which must be kept to. 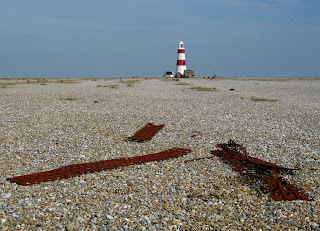 A lot of aircraft testing of bomb trajectories was carried out on Orford Ness, and so there is a danger of unexploded ordinance still to be found. We started out by going to the displays about the history of the area which is inside one of the old military buildings. From there the trail continued on to reach the lighthouse, which is one of the major features. After stopping on the beach for a picnic lunch, we walked back across the expanse of shingle to head to some more of the buildings. Though as you can see, it's difficult to get away from that lighthouse with the ground being so flat! Next point on our tour was the Black Beacon, which was built to house an experimental navigation beacon in 1928. Now it is open as a great viewing platform through small slotted windows. Each window has a picture above it to label what can be seen in that direction. The second trail we followed took us out towards the tall masts which broadcast the BBC World Service radio. 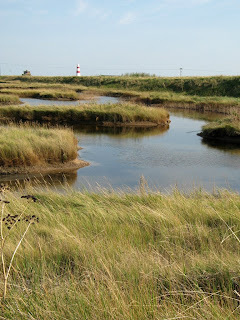 This section of the ness contains lots of grazing marshes, and channels of fresh water. We saw plenty of gulls around, plus some little egrets and wheatears. 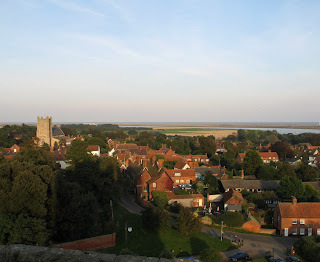 After catching the boat back to Orford we called in for a cup of tea at the Riverside Tearoom, then walked back up through the town to the castle. Here our English Heritage cards got us in for free and we collected our audio tours to lead us around. 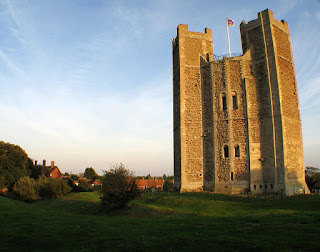 The tour gradually led us up the levels of the castle, ending up on the rooftop. From here we could see all over the town and back across to the lighthouse. Unfortunately we had to rush the tour a little, as it lasts for almost an hour, and we had just 50 minutes until the castle closed. We skipped the introduction, and also the basement section. Back outside we had a brief walk around the ridges of the castle defenses, getting the whole building in a picture by using a wideangle lens which has made an unusually bent castle. The castle really shone in the evening light, looking quite golden. We ended the day by going for tea in the Kings Head pub. In our geocache "Meadows Meander", which is hidden in Ufford, we placed some disposable cameras so that the people who found it could take their picture. The cache has now been in place for three years, and so far two cameras have been filled. Last night I finally got around to scanning in all of the pictures and uploading them to a web gallery. So if you've always wondered what sort of people would use multi-million dollar satellites to locate tupperware containers then have a look here and here. Maybe someone you know will turn out to be a geocacher!